backpacker indonesia : Sultan's Palace as a cultural center, rich with various kinds of cultural noble civilization which has so far remained quite exis, one food culture. 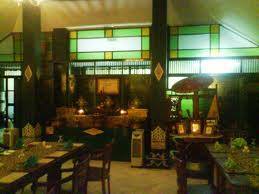 Now the public can try different dishes that are served by Kraton Typical by Bale Raos. Bale Raos is located around the sultan's palace, in the nuances of Java architects, building Joglo who stood with the great, and the aura of the Kingdom of thick add more and enjoy your meal in Bale Raos. Bale Raos Restaurant has an indoor capacity of 80 seats are divided in two joglo and capacities up to 200 seats in the form of a combination of indoor and out door party, with an opening hour is the hour 09:30 to 21:30 pm (except on Mondays and open 9:30 to 15:00 pm). Besides enjoying a typical meal, on certain days can be presented live gamelan music and classical Javanese dance (Beksan), and every Saturday night presents live performances Bale Raos music rumbles. Trained chefs who will serve high-flavored dish that is favorite dishes from the lane VII came to the lane X, as well as the various Kraton family meal. Bale Raos is the right choice for all occasions both formal and non formal education. Among other family events, serving, gathering, private party, as well as the typical culinary tourist attractions and authentic. Yogyakarta palace special menu, made from slices of duck meat served with fried slices of pineapple and grated kedondong sauce. Terbuiat unique dishes from processed pigeon. Catfish fillets are rolled and then baked served with a sauce dazed. The original menu from the Yogyakarta Palace, which is made of sliced beef with herbs and spices is baked with coconut saputan and clamped with a bamboo stick. Soup java classic combination of flavors of ginger and soya sauce and blend of different ingredients. Original drinks from Yogyakarta Palace, which is made from various herbs such as ginger, a cup of wood, clove, lemon, etc.. Variation of grain bestik cow tongue with thick sauce served with potatoes and serces ongklok (a kind of favorite vegetables stoop Sri Sultan HB IX). Beef stew milled with a sweet sauce served with mashed potatoes and the sauted vegetables. Diungkep duck dish in the brown sugar with spices and fried with a sweet taste.